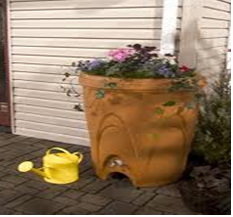 Rain harvesting is the accumulating and storing of rainwater. The easiest way to do this is with a rain barrel. The barrel is connected to the spouting on a house or building and the rain runs off the roof and into the barrel. The water picks up few contaminants and can be used to water lawns and gardens and to wash your car.